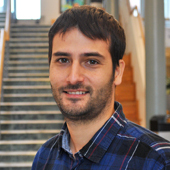 Nil Garcia is a postdoctoral researcher in the Communications and Systems group (CS) of the department of Signals and Systems (S2) in Chalmers. He received his M.Sc. in Telecommunications Engineering from the Polytechnic University of Catalonia (UPC) in 2008. After his studies he did numerous internships and worked for one year in Centre National d'Études Spatiales (CNES) in Toulouse. He then pursued a dual PhD in Electrical Engineering in New Jersey Institute of Technology (NJIT, USA) and Institut Nationale Polytechnique de Toulouse (INPT, France) and graduated in 2015. His current research interests are in positioning and in communications for Cooperative Intelligent Transportation Systems (C-ITS). There might be more projects where Nil Garcia participates, but you have to be logged in as a Chalmers employee to see them.